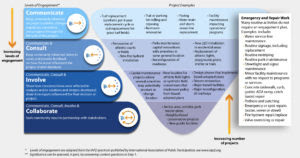 Recognizing there’s no one-size-fits-all approach, the guide aligns the level of public engagement needed based on the characteristics, benefits and potential impacts of each project. The six-step process highlights how engagements should be planned, implemented and assessed. Over the last year, the County Manager’s office worked with both internal and external stakeholders to develop the guide. And in the last month, hundreds of staff across the County have been trained on the new guide. Starting April 2, the guide will be applied to new capital projects just coming online. The County also will incorporate engagement levels into the next Capital Improvement Plan. Collaborate: seek community input in partnership with stakeholders. View a one-page snapshot of the guide or check out the full guide. You can also stay connected other important engagement opportunities by checking out the Engage Arlington webpage. The Six-Step Public Engagement Guide is only one of several new engagement initiatives, part of a larger public engagement action plan. Recently, County Manager Mark Schwartz and Civic Federation President Duke Banks held a series of conversations with civic and condo association presidents to explore better communication and coordination with their communities.